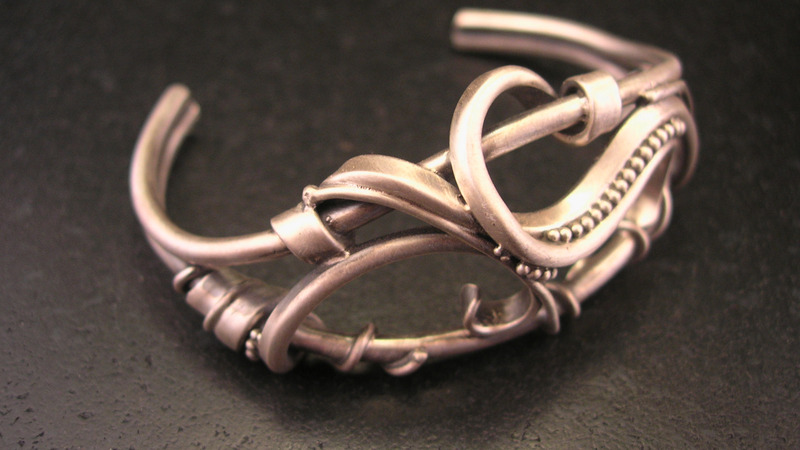 Brittany was drawn to jewelry early, taking classes at Edina Art Center when she was 12. She went to Minneapolis Community and Technical College to study jewelry-making. Her passion took her to School for American Arts in Rochester, NY where she got a "bona-fide degree in metal." After school she decided she wanted to work for herself and came back to MN. "I make things out of necessity," says jewelry-maker Brittany Foster. Her hand-made rings, necklaces, and bracelets have been called both delicate and industrial. She has sold her work all over the US and continues to make a living from her apartment overlooking Powderhorn Park. Brittany was drawn to jewelry early, taking classes at Edina Art Center when she was 12. She went to Minneapolis Community and Technical College to study jewelry-making. Her passion took her to School for American Arts in Rochester, NY where she got a "bona-fide degree in metal." After school she decided she wanted to work for herself and came back to MN. Jewelry-maker Brittany Foster's rings, necklaces, & bracelets are delicate and industrial.